Santa Catarina ( Saint Catherine) is a state in southern Brazil. According to the Index of Economic Well-Being calculated between 2002 and 2008, Santa Catarina was the Brazilian state that revealed the highest economic well-being in relation to the others. Its capital is Florianopolis, which mostly lies on the Santa Catarina Island. 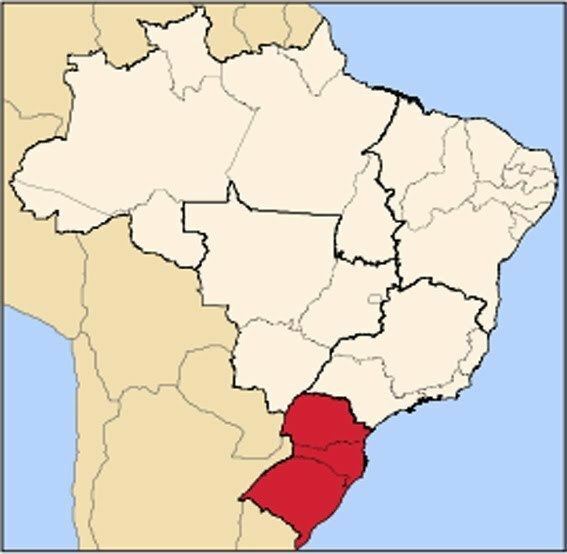 Neighbouring states are Rio Grande do Sul to the south and Parana to the north. It is bounded on the east by the Atlantic Ocean, and to the west it borders the province of Misiones, Argentina. The beaches along the coast of Santa Catarina are a great attraction for tourists visiting the smallest state of the South Region. Florianopolis, the capital, is one of the Brazilian cities with the highest HDI and that receives the most foreign tourists, especially from Europe. In the mountain region, especially Sao Joaquim and Urupema, is an attraction during winter because of its low temperatures and snow. Blumenau, in the interior of Santa Catarina, is the stage for one of the biggest events of the South Region of the country, that possess a strong influence of German culture: the Oktoberfest of Blumenau, a traditional beer party originated from Germany, is held in October in Blumenau city. The heritage of the German, Swedish, Dutch, Italian and Danish immigrants can be seen in the architecture and the customs of the population of the state. Joinville is Santa Catarinas largest city. It was one of the few states in Brazil that actually were colonized by a system of settlement colonization in the case of immigrant settlers coming mainly from modern Germany, Austria, Italy, Russia, Spain, France and Scandinavia. Quality of life is very high by Brazilian and Latin American standards. It is the Brazilian state with the highest levels of income, education and public health, and one of the lowest rates of illiteracy. Santa Catarina boasts Brazils highest average life expectancy and lowest homicide rate in addition to lower levels of corruption. The cities of the state are also considered the most "livable" in Brazil, appearing as the most "clean, safe and organized" of the country. In recent decades, Santa Catarina has been dubbed "the Brazil that worked". 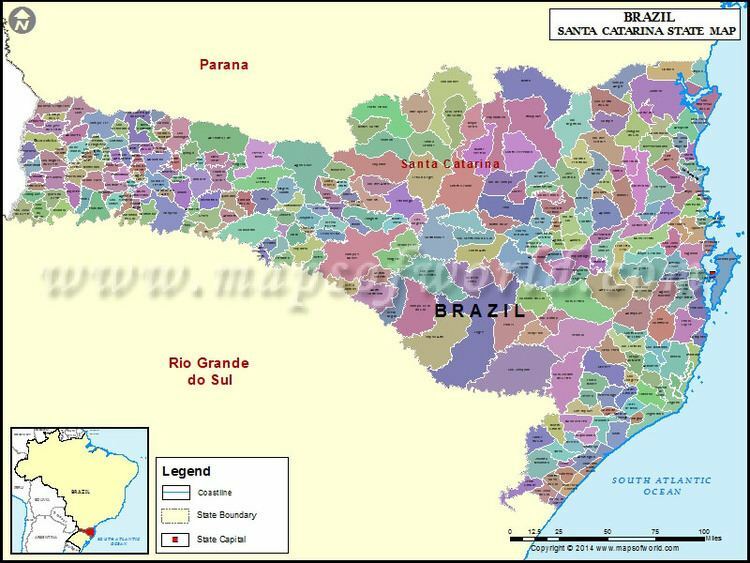 Santa Catarina is in a very strategic position in Mercosul, the South American Common Market. Its position in the map is situated between the parallel 25º5741" and 29º2355" of the Southern latitude and between the meridians 48º1937" and 53º5000" of Western longitude. Florianopolis, its capital, is 1,673 km (1,040 mi) from Brasilia, 705 km (438 mi) from Sao Paulo, 1,144 km (711 mi) from Rio de Janeiro and 1,850 km (1,150 mi) from Buenos Aires. The Serra Geral, a southern extension of the Serra do Mar, runs north and south through the state parallel to the Atlantic coast, dividing the state between a narrow coastal plain and a larger plateau region to the west. The Atlantic coast of Santa Catarina has many beaches, islands, bays, inlets, and lagoons. The humid tropical Serra do Mar coastal forests cover the narrow coastal zone, which is crossed by numerous short streams from the wooded slopes of the serras. 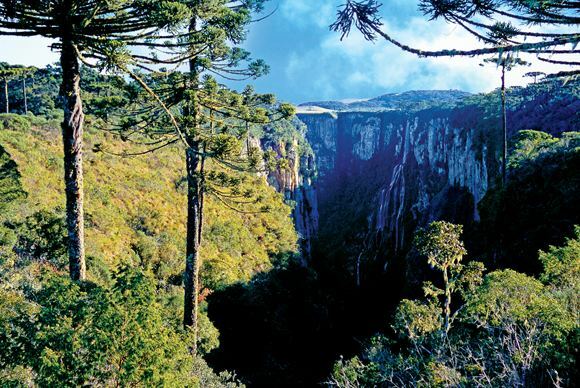 The central part of the state is home to the Araucaria moist forests, dominated by emergent Brazilian pines (Araucaria angustifolia). The drainage of the plateau is westward to the Parana River, the rivers being tributaries of the Iguacu, which forms its northern boundary, and of the Uruguay River, which forms its southern boundary. The semi-deciduous Parana-Paraiba interior forests occupy the westernmost valleys of the Iguacu and Uruguay rivers. The highest point of the state is the Morro da Boa Vista, with an altitude of 1,827 m, and the second highest point is the Morro da Igreja, in the town of Urubici, with an altitude of 1,822 m.
European settlement began with the Spanish settlement of Santa Catarina island in 1542. The Portuguese took control in 1675 and established the captaincy of Santa Catarina in 1738. Between early 19th century and mid 20th century, a great number of European immigrants arrived to Santa Catarina; these immigrants were taken in order to populate the south of the Nation by Imperial initiative. About 50% of these immigrants were from Germany and Austria. The rest came mainly from Italy, Poland, Russia, and Ukraine; these immigrants created an abundance of small, family-held farms, many of which continue to exist in the interior of the state. Late in March 2004, the state was hit by the first hurricane ever recorded in the South Atlantic. Because there is no naming system for such an event in Brazil, Brazilian meteorologists called it Cyclone Catarina, after the state. The industrial sector is the largest component of GDP at 52.5%, followed by the service sector at 33.9%. Agriculture represents 13.6% of GDP (2004). Santa Catarina exports: aviculture 26.1%, wood products 15.4%, compressors 8.5%, cotton 6.8%, and vehicles 5.8% (2002). 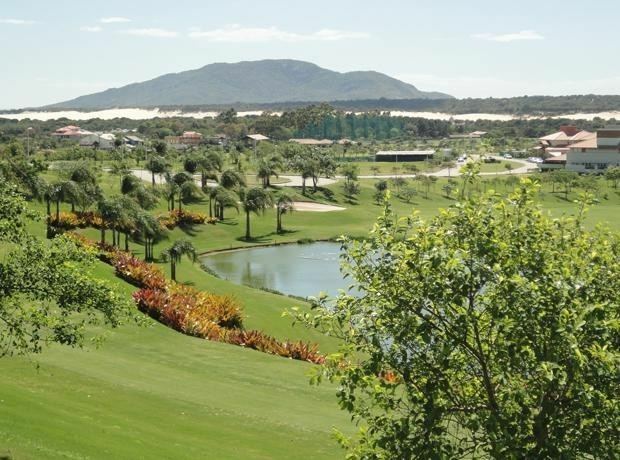 Santa Catarina offers a number of sights and events throughout the year: rural tourism, thermal mineral resorts, ecological tourism and adventure sports, historic monuments and sights, religious tourism, Beto Carrero World and Unipraias parks, and beach resorts of Florianopolis. Some of these sights can only be seen in the off-season, like the snow on the Catarinense Mountain Range - the only place in Brazil where it snows every year. Between July and November, the Right whales visit the states coast. The great festivities take place in October. The main Oktoberfest of Blumenau is Brazils largest and the worlds second largest (after Germanys Munich). Joinville is the host city in July to the widely acclaimed "Joinville Dance Festival", the annual "Festival of Flowers" in November which showcases orchids produced in the region, and several business events in its Convention Center. Florianopolis, the city/island State Capital attracts a large numbers of tourists during the summer months who visit its 42 beaches. There are also many smaller resort towns, including Itapema, Picarras, Barra Velha and Penha, home to the famous amusement park "Beto Carrero World".